New Music: Jay Electronica feat. 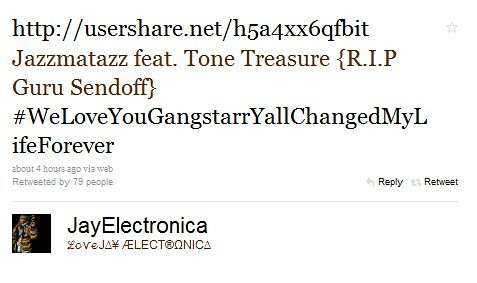 Tone Treasure "Jazzmatazz (Guru Tribute)"
Roc Nation's newest leader just blessed the twitter community with his Guru tribute (R.I.P.) featuring long time collaborator, Tone Treasure. VIBE salutes the fallen legend. Gangstarr forever!